CHICAGO, IL — April 10, 2017 — LoadDelivered, a food and beverage specialized third party logistics (3PL) company headquartered in Chicago, announced today its selection by Transport Topics as a 2017 Top Freight Brokerage Firm. The Top Freight Brokerage Firms list is published by Transport Topics in cooperation with Armstrong & Associates. The list is based on net revenue and includes a description of the types of freight handled. Other finalists include C.H. Robinson, Coyote Logistics, XPO Logistics and TQL. To see the full list, visit http://bit.ly/2vIROZW. 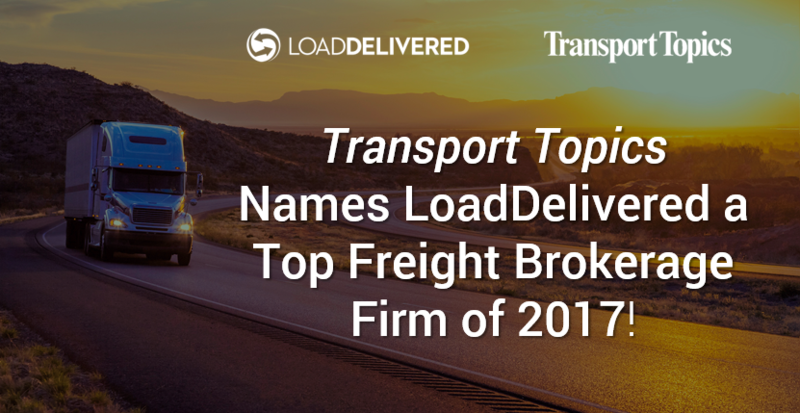 This is LoadDelivered’s first time on Transport Topics’ Top Freight Brokerage Firms list. The company was also named to the Inc. 5000 “Fastest Growing Private U.S. Companies” list for the fifth time and Food Logistics’ Top 100 Software & Technology Providers in 2016. Transport Topics is a weekly newspaper covering the trucking and freight transportation industries. Based in Arlington, Va., it publishes a newspaper (including a digital edition), a website and e-mail newsletters. For the last 80 years, their hallmark coverage of the regulatory environment and the business and technology landscapes makes them unique -- a major multimedia channel, personalized for transportation.